Lock in a great price for Guesthouse Carina – rated 9 by recent guests! The breakfast was incredible. Everything you could want in a breakfast, and the location cannot be beat! The lady at the reception was very kind and she helped with the local recommendations. The room was clean and the location is perfect! Really friendly staff- very helpful and more than accommodating. Breakfast is available in the morning free of charge and was a great spread, far better than we expected. The views from the kitchen and dining area are great! Can't wait to come back and see the new addition that they are building- looks incredible! Both her and her staff made us feel comfortable always and treated us very nicely. The breakfast is amazing and the house is beautiful, super recommendable! Of all the places we stayed in Iceland, Guesthouse Carina was our favorite! The breakfast was spectacular, it was just too fantastic - We have never had such a fantastic breakfast with so many options before!! The Waffle maker was the icing on the cake! Loved the easy check in/check out process, the cleanliness, and the breakfast offered. Location had a great view of town and the ocean. 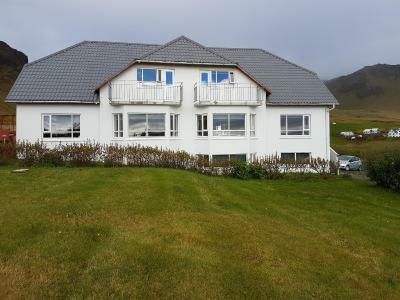 Guest house Carina offers accommodations in Vík. Free private parking and free WiFi are available on site. Guest house Carina's bright guest rooms have access to shared bathroom facilities. Some rooms include views of the sea or mountain. A varied breakfast is served daily. Guests can relax in the shared lounge and meet other guests. Guests can enjoy various activities in the surroundings, including golfing and horse riding. The black sand beach of Vík is just 1,650 feet away. When would you like to stay at Guesthouse Carina? House Rules Guesthouse Carina takes special requests – add in the next step! Guesthouse Carina accepts these cards and reserves the right to temporarily hold an amount prior to arrival. If you expect to arrive outside check-in hours, please inform Guest house Carina in advance. Please inform Guesthouse Carina of your expected arrival time in advance. You can use the Special Requests box when booking, or contact the property directly using the contact details in your confirmation. The window was a bit noisy because of the wind. Beautiful guesthouse. The breakfast was really good! Breakfast was great! Staff were very friendly and accommodating. Shared bathrooms were sparkling clean; showers on the first floor only. Amazing breakfast and lovely host. Breakfast was exceptional, so much choice and a really great waffle maker! Staff were really nice and accommodating. The staff was friendly, the location was great (there is an amazing hike with great views right out the back door) and the facilities are spotless! Appreciated the extra touches like slippers for the guests! Very nice, friendly accommodation, amazing breakfast, super atmosphere. We enjoyed our stay here. Not one complaint, but I have only one minor inconvenience: It would be nice to have a shower upstairs. Breakfast was awesome and fresh! A wide variety of foods are available! They even have a waffle maker :) Great night time view of Vik from the upstairs bedroom I was in! I wish American women were like the women who take care of this place ;) I have been in 4 guesthouses thus far in Iceland, and this is my favorite one so far! Breakfast to start serving at 7am. Quiet time begins at 10:00pm. Perhaps it felt a bit cramped with people when we arrived at night but I would gladly go back. 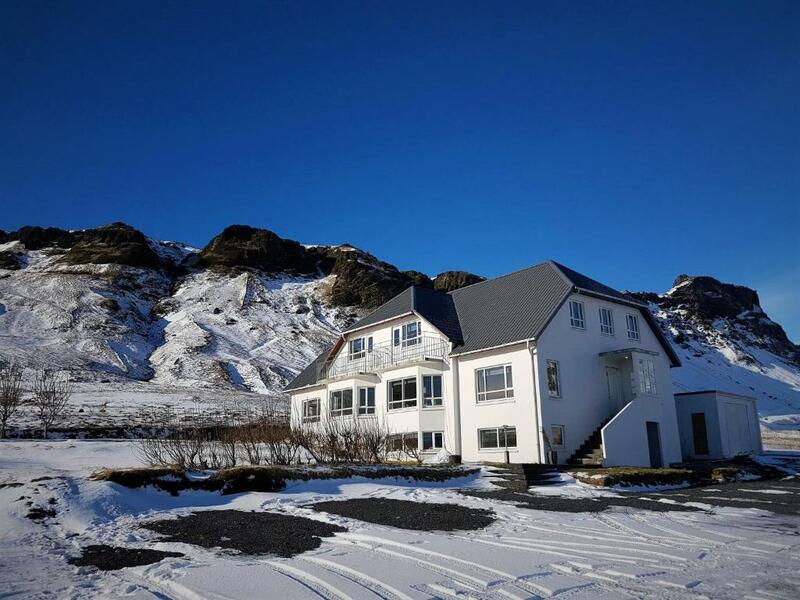 Nice little guesthouse, good value for money in Iceland. Bathrooms were clean and not busy even if shared among many rooms (bring flip flops as the bathrooms with the shower might be far from your room). Quite strong noodles broth smell when we arrived but thankfully it was replaced by lovely breakfast smell in the morning. Best thing probably is the breakfast, varied, abundant and delicious (fresh waffles a real treat!). We had dinner at Smidjan Brugghús, is was very busy on a Wednesday night (was nice to find a place open at 21:30 and still serving good food) great burgers and dessert, cool atmosphere and staff!